A great photo, lovely shot! OMG, i LOVE the lace skirt! 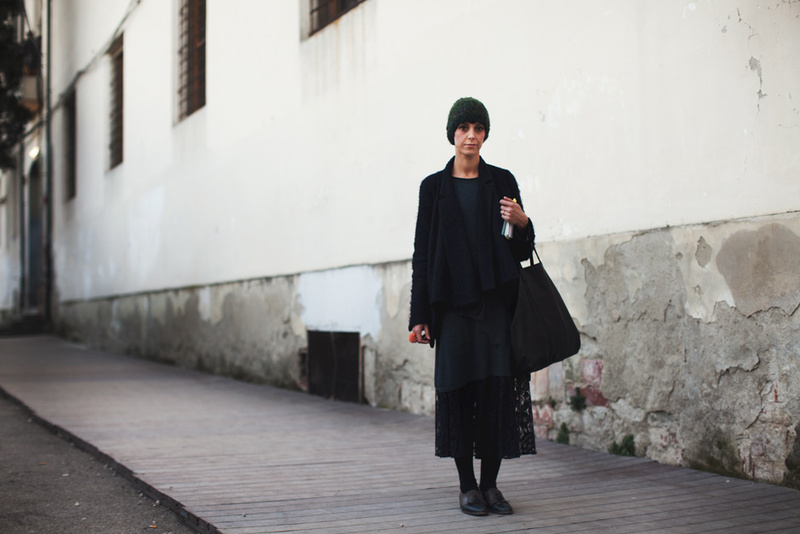 From these picture, it seems that Italian ladies love total black outfit. Why? Why do I ask why? Why did I not get any time in Florence last summer. My niece was married near there and we never got past the airport. Why? Because we lost a whole day thanks to a terrible airline called Meridiana Fly. So we were out in the countryside, which was amazing, for the wedding but never got to see the equally and differently amazing city where you are now. That does it, we have to go back and soon! Great shot. Thank you! OK. Now this blog is beginning to interest from the perspective of photography as well as style. Beautiful photo! Black layers are very interesting, I love her look! I really like this austere style which seems simple and plain, but is actually quite rich and complex (the various textures, layers). I love how monochrome her outfit is! It really draws attention upward to the face. Too dark and sad. Typical italian women all black winter outfit which usually works. Is that a lace skirt I see?!? LOVE! Qu’elle est belle est simple!!! J’adore le noir sur elle. And the background is so simple yet so perfect with her look. Great photo! The height of the exposed stone base makes the building seem so much more massive. Beautiful long range photo. Cute knit hat! I think she looks a little sad in this, and too overwhelmed by the layers of black. I do not like those shoes with the outfit either. Perhaps she needs a spot of colour in this? I love this photo! Very wonderfully shot, and her skirt is lovely! I love all of the contrast in this photo; the texture, the black and white. And something about the lonely ambiance appeals to me. Lovely in general. Amazing photo, really… so inspiring! One red “dot” on the finger – nice detail to all the black. She is not sad at all. amazing perspective. She looks like she is coming up out of a dream. I think this is such a great shot. Love how she’s wearing bold, dark colors and against that white/grey wall – it looks amazing! austerity always wins in my book. I love it. Tradition is alive and well. Love the way you shot this photo – beautiful! beautiful photo. the composition is stunning.